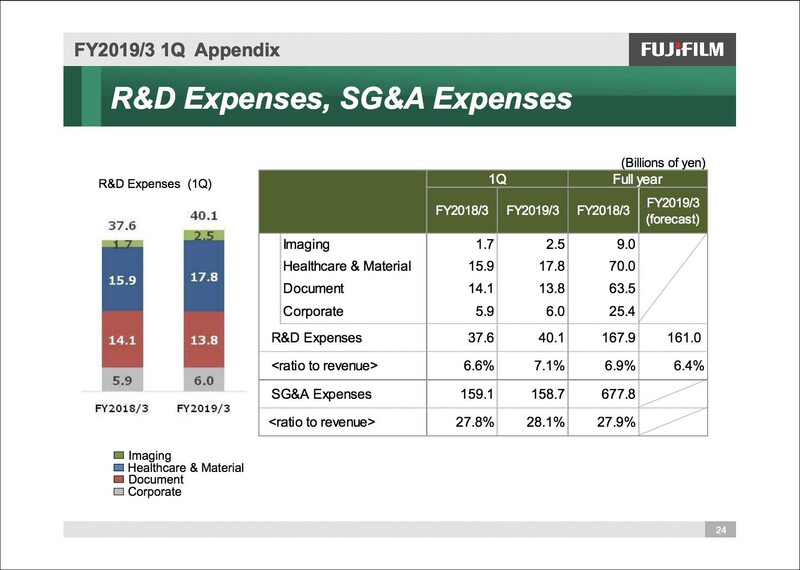 Fujifilm has invested heavily in their R&D and for FY2019/3 Q1 they had to disclose that these expenses are affecting operating income growth. They also continue to have strong Instax sales thanks to the release of the Instax Square SQ6 as well as increasing their projections for annual sales from 9 million units to 10 million units due to increased sales in the United States and Europe where sales are strong and in the emerging markets. 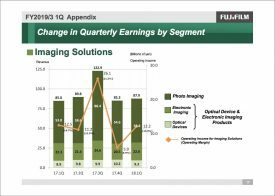 In the electronic imaging business, overall revenues increased thanks to the Fujifilm X-H1, Fujifilm X-T100 and lens sales remained strong, espxially for 4k video lenses used for broadcast. There was also a lot of investment in R&D for a new sensor and processor to be used in future Fujifilm cameras like the Fujifilm GFX100S, GFX50R, and X-T3. In the photo imaging business, sales were strong in instant photo systems such as the instax series and instax films. The sales volume of the instax series totaled 1.75 million units in this quarter. Sales increased with instax SQUARE SQ6, the instant camera with simple and stylish design which adopted square format, launched in May 2018. Wall Decor, Photobook and other value-added printing businesses also expanded and contributed to the revenue. Regarding instax, we have revised the targeted annual sales volume upward from previously announced 9.0 million units to 10.0 million units, estimating the sales increase both in the U.S. and Europe, where the sales are strong, and in the emerging countries. 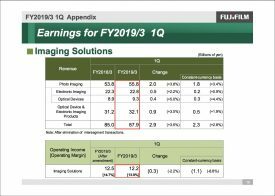 Imaging Solutions consolidated revenues were up 3.5% over the same period last year due to the sales increase in all businesses, while consolidated operations income was down 2.2% due to upfront investment in R&D for the Fujifilm GFX100S, GFX50R, and X-T3. 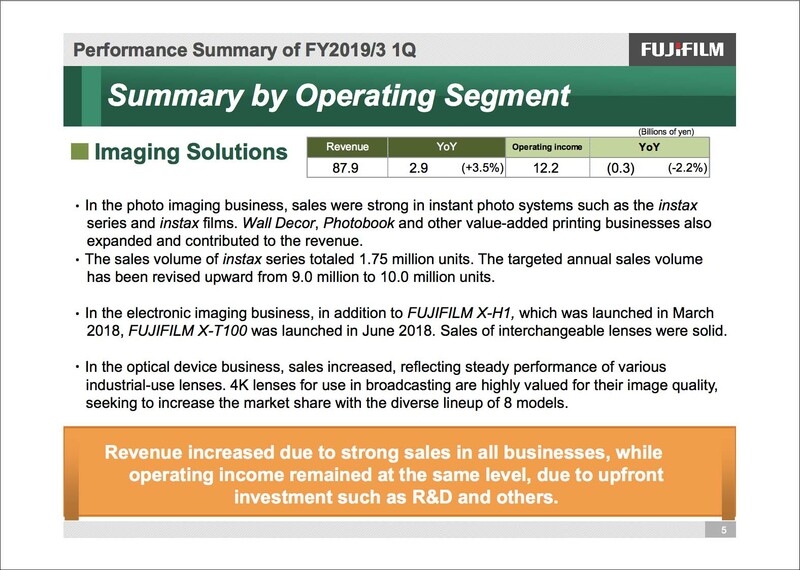 In the photo imaging business, overall sales increased due to favorable sales, especially in instant photo systems which enable users to enjoy on-the-spot printing of photos, such as the instax series and instax films. Strong sales were seen in instax SQUARE SQ6, the instant camera with simple and stylish design which adopted square format, launched in May 2018. In the high-value-added printing businesses, sales expanded thanks to continued business growth from various services, including PhotoZINE, which enables immediate production of photobook in stores and Wall Decor services that enable users to enjoy decorating their rooms by displaying photos in a panel and a framed canvas. Sales also increased via Super Easy Print Applications, the smartphone app released in December 2017, boosting fresh photo-printing demand from smartphone users. 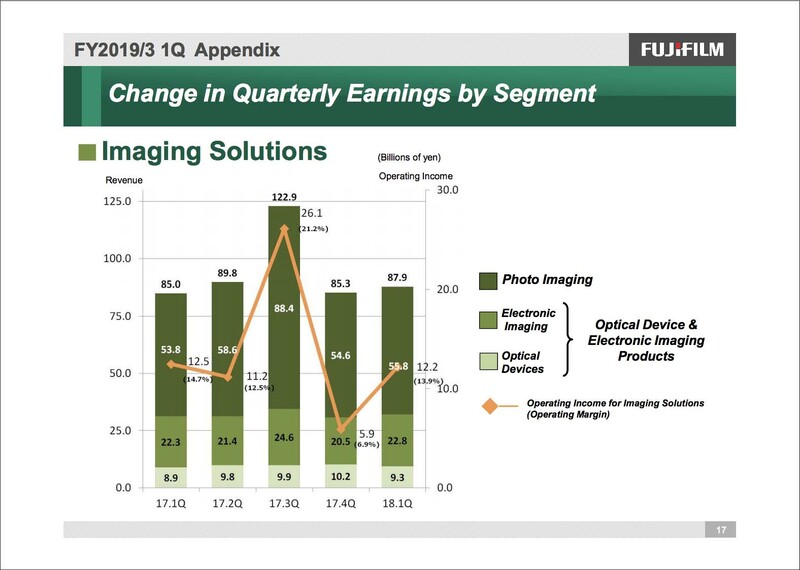 In the electronic imaging field of the optical device and electronic imaging business, overall sales increased due to strong sales of X Series such as FUJIFILM X-H1, which has a newly-developed robust and durable body with superior image quality and easy operation, lauched in March 2018, and FUJIFILM X-T100, an entry-level model that realizes high image quality in various scenes with comfortable operation, launched in June 2018, and interchangeable lenses. In the optical device field, overall sales increased, reflecting the solid sales of various industrial use lenses such as lenses for vehicle camera. 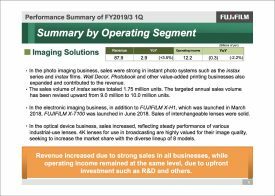 Fujifilm is the pioneer of 4K lenses for use in broadcasting with highly valued image quality, and is seeking to increase its market share with the diverse lineup of 8 models. 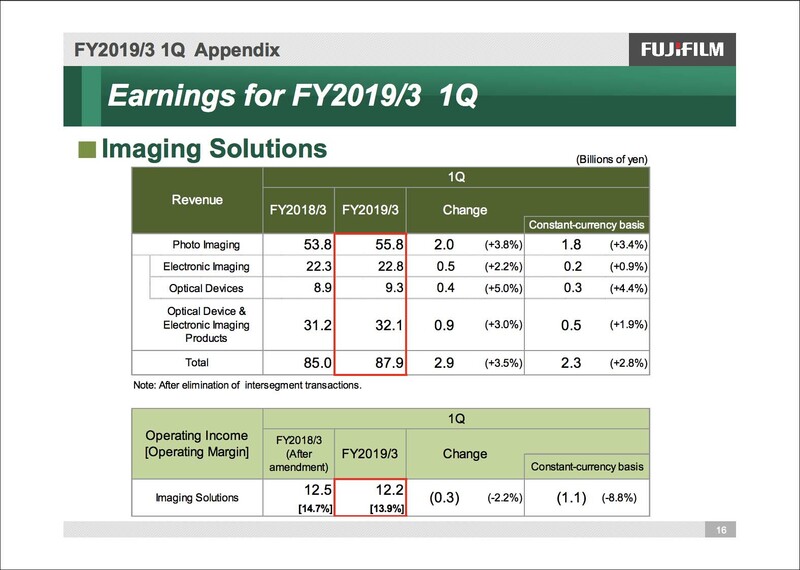 This entry was posted in Fujifilm GFX 50R, Press releases and tagged Financial, Financial Report, financial results, Fuji GFX, Fuji GFX 50R, Fuji GFX50R, Fuji Rumors, Fujifilm, Fujifilm GFX 50R, Fujifilm GFX50R, Fujifilm Rumors, FujifilmRumors, Fujirumors, GFX, GFX 50R, GFX50R, Medium Format, Super Full Frame. Bookmark the permalink. Trackbacks are closed, but you can post a comment.